Hi I have a 1951 sailing boat built for the Royal Engineers to do the Fastnet Race. I am the fourth owner. The Regiment/ an Officer owned her for 15 years each and the owner prior to me, a naval architect, had her for 25 years and did a circumnavigation. His next trip was to be across the Atlantic, up the west coast of the U.S. to Alaska. As part of his preparation he double screwed each plank with a view to strengthening and stiffening the hull. I had her out of the water a couple of weeks ago and noticed a small section of rot. The rot had arisen because of water ingress at the point of a double screw fixing, the screw fixings had only a few millimeters between them. I removed a section of the plank so I could get fixings onto 3 frames either side of the damage and fitted a new section of plank, fixing with copper nails and roves, caulked and no problem. A more detailed inspection suggested that there may be the start of other rot at double screw fixing locations. I am intending to sand down to discover all the screw fixing locations and replace with copper nails and roves and if necessary cut out any dodgy pieces of timber. 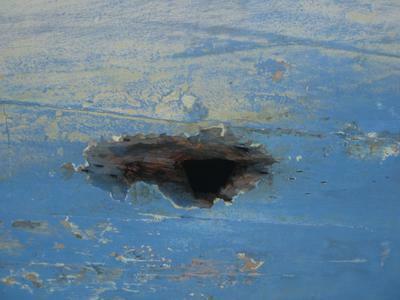 A local boat builder has suggested single copper nail and rove fixings as opposed to double, and, having removed the screws to clean out the hole to make sure there was no rot and hammer in a Douglas Fir, or other pine wedge, into and through the hole having dipped the pine into anti-fouling paint. The new copper nail fixing to then be hammered through a pilot hole into one of the wedges. I would appreciate comments regarding this course of action. By the way the boat is a cracker and having just sailed the Bay of Biscay in her is as steady as a rock. We did 240 miles in 44 hours through some good seas so I want to make as sure as I can that I get her right. Possibly part of the difficulty was that she was moored in fresh water for about a decade. Hi, a little update on Right Royal. 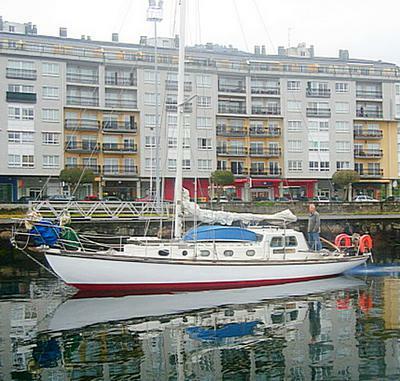 After undertaking the fixes and replacing planks Right Royal was sailed around the north of Spain and into the Med. we were blessed with good weather, sometimes too good, even becoming becalmed going around Cape Finister. I over wintered at Valenecia and undertook a significant repair including replacing the cover boards and some small areas of western red cedar deck. Right Royal is now sailing the Greek Islands, currently the north and south Ionian. After a couple of years island hoping in the sunshine I am getting the urge for a major adventure again and am thinking of an Atlantic circuit with a view to sail east from Boston to arrive in the north west of Scotland. Not this year but next. Another bit of maintenance and checks this year. A good inspection out of the water and all should be good. She sounds like a darling of a boat. Only comment is that she has been in fresh water for 10 years and " Salt water is my friend and fresh water is my enemy". I might suggest that the "Douglas Fir, or other pine wedges" be cut as per plugs with the grain running across as opposed to along as in doweling and that they be glued in. Thank you for your response regarding Right Royal. 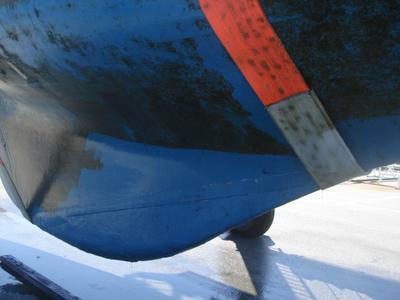 I was looking at the photograph and it seems to me that the hull profiles are identical. Right Royal was designed by Robert Clarke and built by J.I. Thorneycrofts and Co. Woolston and kept in class to Lloyds Register until 1964. She was splined with copper nails and roves originally and then in about 2000 to 2003 a double screw was inserted for an Alaskan voyage. The double screws were located at the edge of the planks with the idea that this would reinforce the hull against the weather and seas they would have to put up with. Some of these fixings look to me (no expert) as though they have allowed water penetration and the resulting rot. Even in the the plank I replaced, which is the worst area, the frames were solid with no evidence of decay. The other areas are small but I have only prodded and probed without opening up properly but certainly nowhere near as bad. Maybe only between these double screws that angle inwards from about 20mm apart at the entry to 6mm where they fox to the frame. 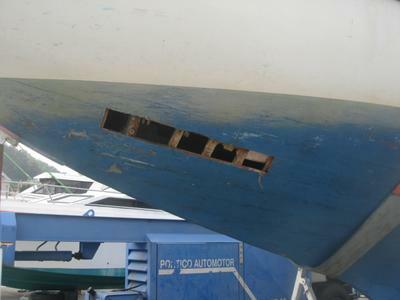 So having fixed the section of rot I have found, I have her back in the sea water and I am intending to do a good internal inspection and then if all looks well take her down into the Med from Viveiro in northern Spain and find somewhere at the back end of the year where I can take her out and sand down to do a detailed inspection of the outside. That is my current plan but any comments are gratefully recieved. By the way I used up the few long copper nails I had fitting in the new planks. Do you know where I can get more at a reasonable price? I own one of the sister ships, Joliette. She appears to have been fastened with single copper nails into each frame and then bronze screws were added at some point. So, she is double fastened at each frame, with a copper nail and bronze screw. She also has quite a lot of steel in her e.g. strap floors fastened with galvanised steel bolts. I've come across a few spots where the planking has decayed due to long-term eletctrolysis i.e. where a copper nail or bronze screw has been in contact with a steel fastening. I've just completed a major renovation over the last 18 months you'll find some pictures on my Facebook WightProjects.